Ohhhh if there was a week for soup making, then this week (and last) is it! Soup connoisseurs will say “every day is soup day” and “soup has no season!”… Okay. Well for me, soup days are those days when you crave an inner warmth. Food that warms your bones and muscles. Soups should be layered in flavor, have a pleasing texture, and be visually appealing. These requirements could actually be anything food related the more I think about it, but since it has been a soup day.. these requirements are for soup. So, let me tell you how this recipe stated and how we got here today. Thursday afternoon KFOR’s Heather Holeman had a guest on the 4:30 show discussing, from what I understood, was “Hipster” food: Avocado toast was brought up, but the guest also discussed how “Bone Broth” was a hot new trend in soups. Bone Broth to me is just stock, but…. #FoodTrends. So from that segment of Heather’s show, I started thinking about the chicken stock that I had made and froze last week. From that thought, soup ideas started flooding my brain: Chunky vegetable style soups, velvety chicken soups, a meaty minestrone, or a richly layered Persian bean and noodle soup. All of that sounded great. I started thinking about the homemade Paneer cheese I had made the day before and "hmmm...what could I do wit that?". I know… A flavorful South Asian/Indian Red curry Butternut came to mind instantly… followed up with adding delicious bright tomatoes (I had also just finished shooting an infomercial for Red Gold Tomatoes at KFOR) and BOOM! This week’s recipe for the In the Kitchen With Scotty segment of "Rise and Shine" was born! I guess what I am saying is… Thanks, Heather?! So what is Paneer cheese? Well… it is simply "Farmer’s Cheese" in style, commonly used in some South Asian cuisines like India, Pakistan, and even Afghanistan. Paneer is a non aged, acid formed cheese, made my curdling hot whole milk with some sort of acid; In our case, lemon juice. It is more firm the longer you let it dry and has an almost tofu taste (if tofu has a taste). It is non-melting… like squeaky cheese curds. Why use it? Well in those regions and cultures it adds to a meal… almost as meat would add to a meal. It has a firm texture like meat and my guess is, if you were poor and had only one cow, it would be better to utilize her milk for the family instead of grilling her for steaks or making her stew meat. Now that that’s over... let's get to this week’s recipe. According to the author of this recipe adding 1/2 cup of water to your large stock pot and bringing it to a boil before adding the 2 quarts of milk, will help to prevent the milk solids from caramelizing in the bottom of the pan and mixing into your cheese. Naturally, I did not read this part (like I do) and added the 1/2 cup of water to the milk and began heating. I did not have any issues with the milk caramelizing on the bottom, but I was also very attentive while making and knew to heat the milk slowly…. Thinking it would caramelize and mix into the final product. If you are not an attentive person while cooking I would recommend adding the water first and heating, then add your milk. I would do this even you are attentive becasue the author of this recipe seems to know what he/she is talking about. I just got lucky. Drain off the whey with the curds remaining. In a large heavy bottom stock pot add the 1/2 cup of water and bring to a boil. Add in the 2 quarts (1/2 gallon) of whole organic milk. Slowly bring to a boil over medium-high heat. Once the milk comes to a boil immediately add the 1/2 cup of fresh lemon juice. Right before your eyes, the milk will begin to curdle, separating the milk curds from the whey. Lay the cheesecloth over a large handheld strainer or secure over a large bowl. Pour the curds into the cheesecloth, separating it from the whey; discard the liquid whey. Allow excess water to drip away then carefully (it’s hot!) twist the cheesecloth into a ball and squeeze out excess water. Weigh the top of the paneer with something heavy, like canned vegetables, allowing more water to be pressed out. Do this for around an hour. Chill until ready to use the Paneer. 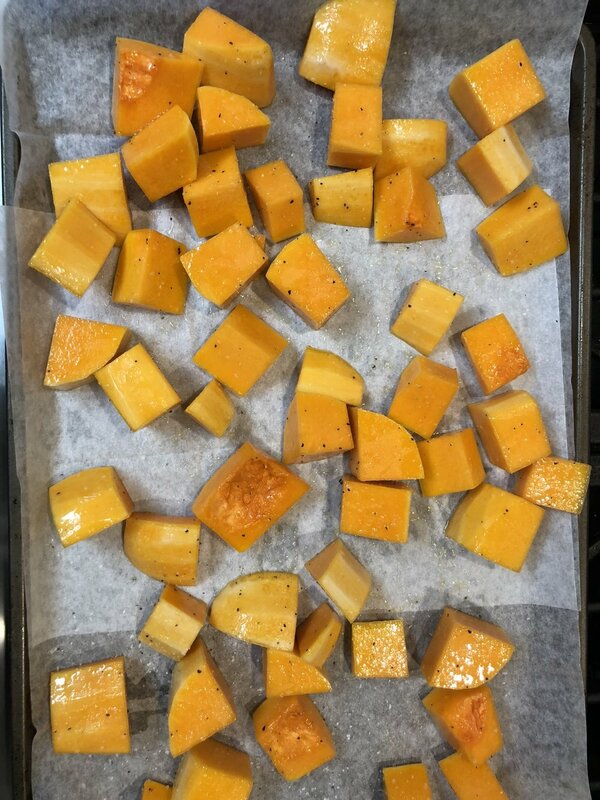 Butternut Squash ready for roasting! Red Gold Tomatoes... the ONLY brand for me! 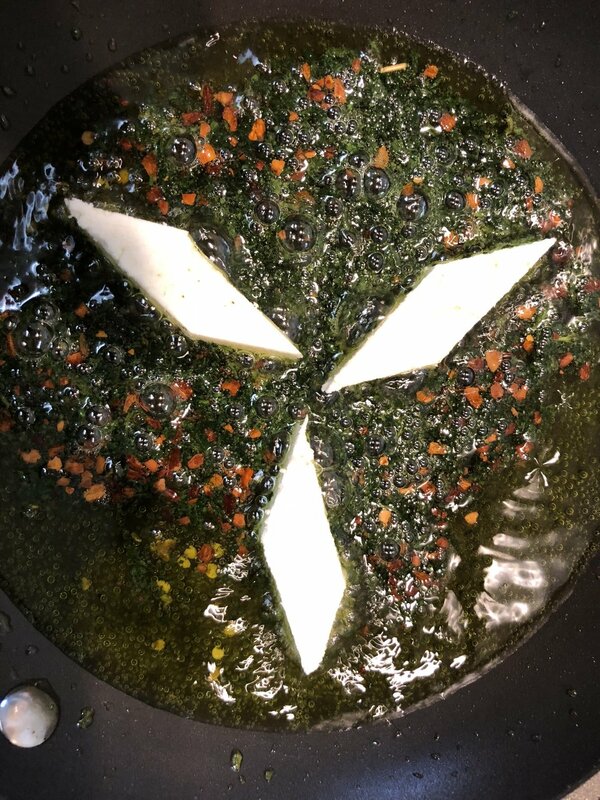 Pan frying the paneer cheese in cilantro-red chili oil. Preheat your oven to 400 degrees “roast”. In a large mixing bowl add the cubed butternut squash. Drizzle in the 1 tablespoon of olive oil and add the vinegar. Season with a good pinch of Cook’s Line Seasoning or Salt and Black Pepper. Toss everything together to coat evenly and pour out onto a sheet pan. Roast in your oven for 18-20 minutes or until lightly caramelized. Remove and set aside. In a heavy bottom soup pot, and a glug or two of olive oil and begin heating over medium-high heat. Add the Red Curry Powder and mix around to fry in the oil. This really brings out the various flavors in the curry. Next, add the diced onions and slowly begin to cook. Once tender and lightly caramelized add the minced garlic and cook until fragrant. Spoon in the roasted butternut squash. Pour in the can of diced tomatoes with the juice, followed up with the chicken or vegetable stock. Cover and slowly simmer for 20 minutes. Remove all the solids to a food processor leaving the soup liquid behind. Process the solids into a fine puree. You may also use a hand blender. Return the puree back to the soup and stir in to combine evenly. Gently heat through and keep hot (on low) covered. In a sauté pan add 1/4 cup of grapeseed oil. Begin to heat to medium-high heat. Add the cilantro and red pepper flakes, followed up with the cut paneer cheese. Brown the paneer on both sides and remove the cheese to a paper towel and allow to drain off any excess oil. Season lightly with salt. When ready to serve the soup, pour generous portions into individual bowls. 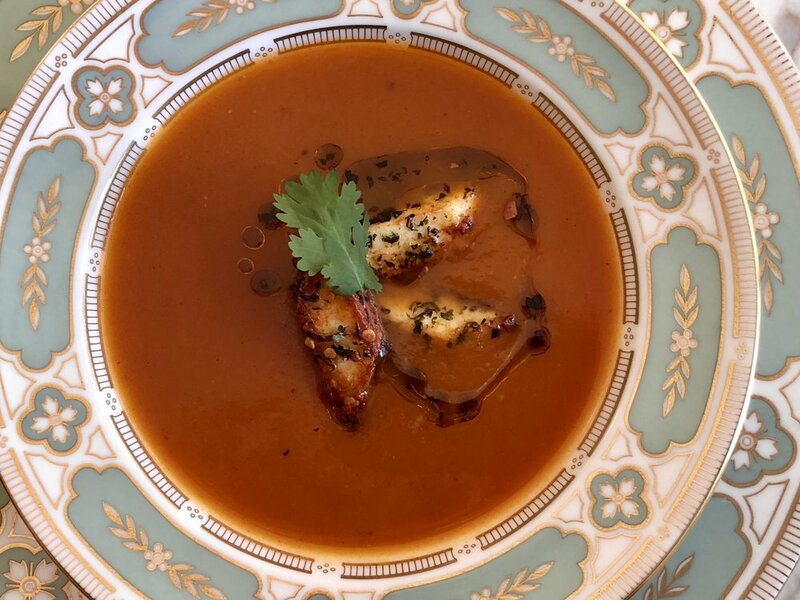 Add the cut and fried paneer cheese to the soup, followed up with a light drizzle of the cilantro/red pepper flake oil for an additonal layer flavor and seasoning. Garnish the top with cilantro leaves and get your taste buds ready (“…they’ve been ready!”). Enjoy!